We’d love your help. Let us know what’s wrong with this preview of 59 Glass Bridges by Steven Peters. 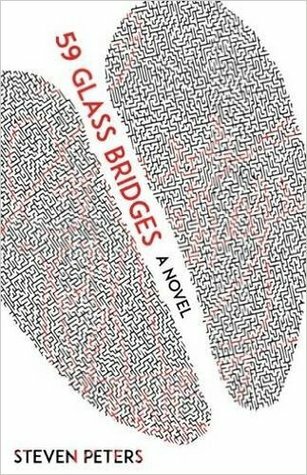 In 59 Glass Bridges, an unnamed narrator travels through a maze that is at once mutable and immutable: walls fall to vine-filled forests, hallways to rivers, bridges to lamp-lit boats. What remains is the desire to escape. He is led along his harrowing path by Willow, a mysterious figure who cajoles him and responds to questions in a winking sphinx-like manner, with answer In 59 Glass Bridges, an unnamed narrator travels through a maze that is at once mutable and immutable: walls fall to vine-filled forests, hallways to rivers, bridges to lamp-lit boats. What remains is the desire to escape. He is led along his harrowing path by Willow, a mysterious figure who cajoles him and responds to questions in a winking sphinx-like manner, with answers that are often more baffling than clear. Interspersed are the memories of the narrator, of his childhood and adolescence, and of his grandmother, a wise artist who at once pushes his creativity, while leaving him the freedom to craft his own journey. To ask other readers questions about 59 Glass Bridges, please sign up. I am fully aware of my intellectual limitations when it comes to 'art' so, maybe, I wasn't really surprised that I couldn't find a resolution at the end. It was a pleasant enough time reading it but, with no resolution that I could discern, I ended up feeling abused. And the riddles/ryhmes around the boatman crossing the river drove me nuts. Does anyone else have similar feelings? I loved this book - but not for the reasons I thought I would. I came in expecting a serious, thought-provoking yarn. What I got was exactly that - but also, a fun romp through a maze akin to Alice in Wonderland with a blue streak. The imagery was compelling, the characters interesting and likable. Without spoiling anything, part of the fun of this book is grasping at the unknown, searching for meaning, questioning the narrator and imagining the consequences. I finished the book in two sittings - I loved this book - but not for the reasons I thought I would. I came in expecting a serious, thought-provoking yarn. What I got was exactly that - but also, a fun romp through a maze akin to Alice in Wonderland with a blue streak. I finished the book in two sittings - and plan to read it again at a slower pace, just to absorb all of the nuances. 59 Glass Bridges loops two stories together. The first story is a nightmarish vision of the enclosed overpasses which crisscross downtown Calgary, where the narrator finds himself lost and wandering, while the second story is the narrator’s memories of visiting corn mazes in rural Alberta with his grandmother. While the nightmare half of 59 Glass Bridges describes Calgary as a labyrinth built of impossibly strange towers containing whole rivers, Steven Peters writes the narrator’s pastoral memori 59 Glass Bridges loops two stories together. The first story is a nightmarish vision of the enclosed overpasses which crisscross downtown Calgary, where the narrator finds himself lost and wandering, while the second story is the narrator’s memories of visiting corn mazes in rural Alberta with his grandmother. While the nightmare half of 59 Glass Bridges describes Calgary as a labyrinth built of impossibly strange towers containing whole rivers, Steven Peters writes the narrator’s pastoral memories of his grandmother with a delicacy in stark contrast to the surreal extravagance of the narrator’s descriptions of the city. The characters seem real and their effects on the narrator are reflected in his later journeys. 59 Glass Bridges tells us not only how labyrinths are built, but how best to wander through them. It is a story about being lost, how to be lost, and when we first were lost. It is worth a read. A twisted maze of a book: both wacky and strange as well as warm and heartfelt. 59 Glass Bridges is a fun and smart taste of contemporary CanLit. The relationship between the grandmother and grandson. Sweet and mischievous. I enjoyed the throwbacks to the 90’s and the garden wars. There are plenty of delightful, relatable, and at times painful vignettes about Grandmother and grandson. The maze and the resolution. It’s a metaphor. The guy (what is his name!?) was on his bed, looking up at the ceiling after his grandmother died. He was creating one last story, in which he triumphed over the roughest part of his grief—acceptance. Awesome. Like a pop culture Borges, Steven Peters plunks us down in the middle of a surreal labyrinth full of talking owls, creepy locals, Starbucks, and Reeboks. And just when you're starting to feel a little unhinged, he grounds you in an incredibly moving and parallel story about the protagonist's troubled parents and spirited grandmother. Fast moving and full of killer prose. Highly recommended. I honestly have no idea how I feel about this book.